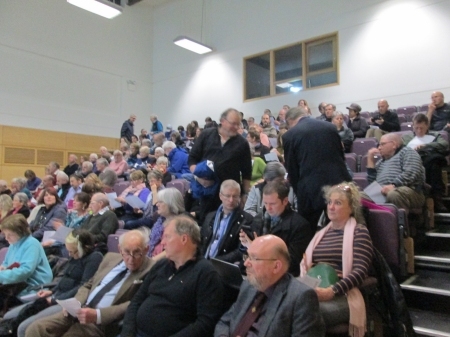 Yesterday evening over 240 people attended a meeting in the Nairn Community and Arts Centre where there was a presentation by the Cromarty Rising campaign group. The presentation was followed by a long question and answer session. Discussion of the content of the meeting is very much underway on the popular Nairn Rocks and Nairn Our Town Facebook groups. You can see what is being said here and here. For anyone who couldn't make the meeting in Nairn and wants to find out more please have a look at the video of Jacqui Ross's presentation from the recent Cromarty Rising meeting in Inverness, it covers many of the points which were made last night. Also visit Cromarty Rising website for more details and information. Auldearn Community Council boundaries include Nairn Bar and the inter-tidal zone and wetlands to the landward side of it. This area is afforded SAC and SSSI status. We would like to hear from anyone who wishes to express an opinion about the proposal being made by the Cromarty Firth Port Authority. It's all about the Cromarty Firth Port Authority making more money. We're a money driven capitalist society so I expect they'll go ahead with the project. We've been quite happy to exploit all sea life over the centuries so I don't see this as a real argument for stopping this project. 250 people is not a huge turn out for the size of Nairn! Population of 12,000 and you think 250 is HUGE. However Good luck to all this Sunday on the beach.